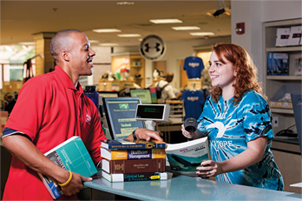 Visit the AACC Bookstore (online or in person) to obtain the most current, accurate textbook information. We begin posting titles up to six weeks before each major term, and earlier when possible. Our information comes directly from your faculty, so you can be sure it's correct - you have our guarantee. Shopping early gives you the opportunity to search the open marketplace, including the AACC Bookstore, for the best price and availability of new and used textbooks. We offer a comprehensive price match guarantee. For full details, please visit the Price Match Guarantee page. Make sure to verify the ISBN in addition to title, author, edition and publication date. The ISBN is the key identifier of a title, and is the best information to use when searching the open marketplace for your textbooks. We list ISBNs on AACCBOOKS.COM, or you can find the ISBN on the back cover of a textbook or inside along with the copyright information. We want you to get the right book, even if you don't buy it from us. If you have trouble finding the ISBN, ask our bookstore staff or your instructor. Buy used when possible. Used books typically save you at least 25% off the cost of a new textbook. Check "Books for Sale" postings on campus bulletin boards, especially the large "Textbook Exchange" board just outside of the AACC Bookstore. Look through online used book classifieds sites. We offer our Textbook Swap feature, but there are many others. Remember that there are no refunds when making a peer-to-peer purchase though, so CHECK THAT ISBN! If buying from an online bookseller, shop with a reputable source. You can definitely find bargains online, but be sure to factor in shipping costs and shipping time. Be careful of instructor or international editions. They are often available in the marketplace at rock bottom prices, but you won't be able to sell them back to reputable buyers and you might not be able to use the text in class. Some online sellers buy these books and then try to disguise them as the standard version. Find out in advance what happens if you drop the course or decide you don't want or need the book - can you get your money back, and will it cost you anything extra to do so? We offer a very flexible return policy, allowing you to return your textbooks up to three weeks after the start of classes if you have your receipt and your texts are in their original condition. Buy access to digital versions of textbooks, also known as e-books. E-books are less expensive than a hard copy, and many come with the ability to search content by keyword/phrase, add comments, create bookmarks, and in some cases even come with free access to additional online materials. There can be drawbacks, but the savings are usually well worth it - inconvenience due to online only access; some have restrictions on printing, and most e-books are rentals, not purchases. Your access will expire after a period of time unless you pay specifically for perpetual access. There is no resale value. We offer an ever-growing selection of e-books; just look for the (E-TEXTBOOK) marking on the shelf tag when you come into the store or when browsing online. Check out e-books to see if they are right for you. Bundles can be bargains, BUT... you may find that your textbook is "bundled" in a shrink-wrapped package with other learning materials such as a study guide, software, or a pass code. If you have a choice between buying a textbook by itself or in a package, be sure you will need all of the materials in the package. While these extra learning materials can be of great value, they are often non-returnable once opened. If you have questions about buying a bundle, get input from your instructor or your bookstore staff. It's also important to compare prices between the bundled and unbundled versions of the materials. It sounds strange, but if your class requires an access code, for example, it is often cheaper to buy a new bundle than to buy a used text and a separate access code; in some cases, it's a very significant difference. If you have access to an older edition of the textbook, check with your instructor to see if you can use it instead of buying the most current version. Check out our textbook rental program or rent from a reputable online textbook rental company. Our program offers 500 - 700 titles per semester at up to 65% off new retail, and you enjoy the convenience of renting and returning right here with no shipping fees or hassles! Other companies may have bargains too. Be sure to check policies and return deadlines before you commit. Who is responsible for the shipping each way? Will you have enough time after the final to get it back safely? If the answers all add up, great! Remember, having the right materials in your hands on time for your course is our goal, even if you don't get them from us. Pool your resources with other students and try sharing a textbook. You may need to work out how to split the cost, how best to share time and decide on the disposition of the text at the end of the term but this may be a good option. An added benefit - you could turn your sharing group into a study group. The Truxal Library has a limited pool of current textbooks on reserve. They must be used in the library, but if you don't need to have the book at home or with you in class this is a free resource available to you. It can also be a great way to use the book on a trial basis to see if you really want to buy a copy. Free is good! Some titles, especially classics such as works by Shakespeare, may be available online for free. One source is Project Gutenberg; our E-Textbook page has a small selection as well, and there is an ever-increasing open textbook movement making quality materials available for low or no cost. Sell back unwanted texts at the end of the term. Check with us to see if the AACC Bookstore is buying back your texts; we will pay up to 50% of the new book price. You can also check online buyback services (watch for shipping fees on some sites) or list your books through online classifieds. As when buying books, posting your used books on "Used Books for Sale" campus bulletin boards to sell your books directly to another student is an option. There is a "Textbook Exchange" board outside of the Arnold bookstore reserved solely for student postings.